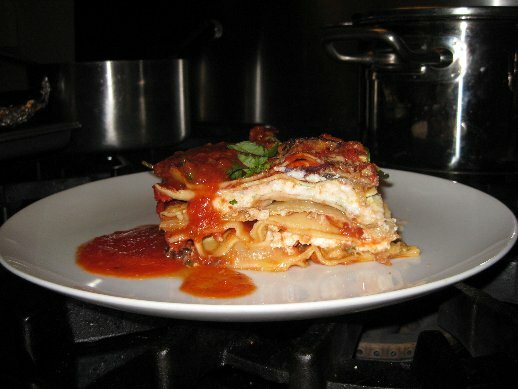 Bologna Style Lasagna Recipe by: Chef John V., A Good Cooking Recipe! Description:This recipe takes a bit of time and love. In the end it is so worth it, it's real Italian grandmother cooking at its best! Some crusty Scali bread, crisp and crunchy salad, and red wine if you like---mama mia, molto bene! Heat a pan over medium high heat, add olive oil, onions, carrots and garlic, cook until the onions are lightly golden, add the ground beef and brown, cooking away any liquid. Add black pepper, allspice, oregano, pepper flakes, salt, sugar, crushed tomatoes, tomato paste and water. Bring to a boil, reduce the heat and simmer 30 minutes on low, stirring as it cooks. Taste it and add more salt if you like. Remove from the pot and let cool to room temperature. Centro brand is very good ! Warm the garlic in the oil to release the aroma (1 minute on low heat, don't brown). First add ground fennel seed, oregano and basil, then the tomatoes, rinsing out the can, followed by the salt, pepper and sugar. Bring to a boil, then reduce the heat to low and simmer partially covered for 10 minutes---stir occasionally. If using whole tomatoes (as opposed to crushed), puree the sauce either by using an immersion blender or by passing it through a food mill. Set aside for assembly. In a pan, heat the clarified butter over medium heat, add the flour and stir until smooth. Cook the mixture about 2 to 3 minutes, making a white roux. Set aside and cool to room temperature. In a sauce pan, heat the milk, and when almost boiling add the room temperature roux and with a wire whisk mix like crazy for 20 seconds to blend it in. Add salt, pepper and nutmeg, reduce the heat to a simmer and cook, stirring often for 15 minutes---it will be very thick--nothing is wrong!!! Just before it's finished, whisk in the Romano to blend. Remove from the heat and cover with plastic wrap or foil---let cool slightly. A large and deep (approx. 3") lasagna pan is preferred. You may also use a disposable aluminum baking pan if you don't leave the lasagna in it over night because the pan may react with the tomatoes and spoil the lasagna with corroding aluminum. Whatever you choose, oil the pan with olive oil on the bottom and sides. Place about 1 cup of the tomato sauce in the bottom of the pan and spread it out. Lay down the first layer of lasagna pasta, so that the bottom is covered with pasta; top the first pasta layer with half of the ricotta and half of the cream sauce and half of the grated mozzarella. Repeat with noodles and this time with all of the meat sauce and the other half of the cream sauce, another layer of noodles, the remaining ricotta and sliced provolone, another and last layer of noodles, the remaining tomato sauce and remaining grated mozzarella. Place on a sheet pan covered with foil, to catch drippings and make clean up easier, and slide on to the middle shelf of the oven. Bake for 45 minutes, then turn the pan around, bake for an additional 45 minutes and it's done. Let cool for 30 minutes before slicing and serving. Sprinkle fresh chopped basil over each portion when serving. *Many people like extra sauce so plan ahead and make a double batch of the regular tomato sauce listed above.